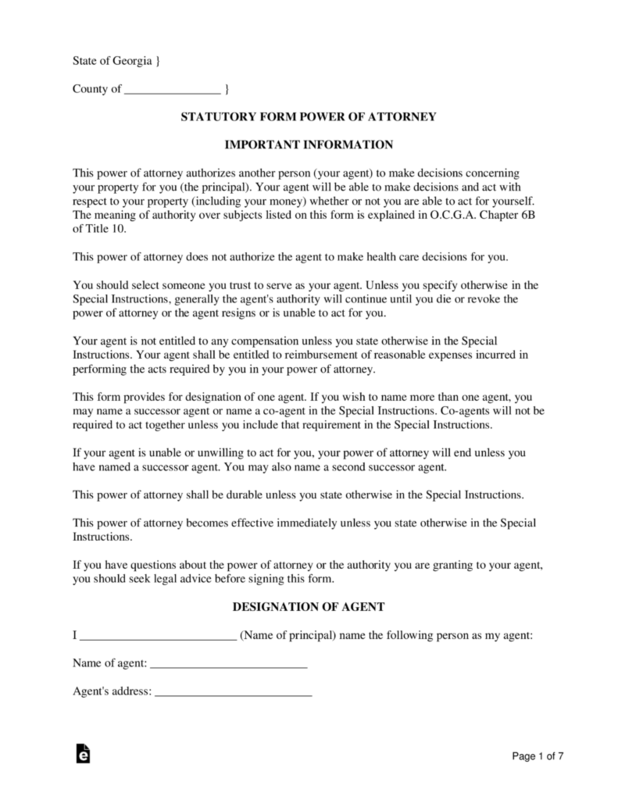 Georgia Power of Attorney Forms can be used in many different ways, from appointing someone to be a guardian over your child to designating someone to represent you with Department of Revenue to delegating the power someone needs to make decisions on your healthcare when you can no longer do it for yourself. In each instance, the principal (person making the appointment) is anticipating the need for someone else to represent his or her best interests when they are unavailable or unable to do so themselves. Durable Power of Attorney – This form is used when the principal anticipates that his or her physical or mental health may deteriorate to the point that someone needs to be available to administer his or her affairs. This type remains in effect through incapacity. General Power of Attorney – This form can be used up until a person becomes unable to make decisions for themselves. It becomes void when someone is adjudged incompetent. Guardian of Minor Power of Attorney – This form allows a person to designate a guardian to stand in the place of a parent when the parent is not available for everyday dealings with doctors and educational institutions. Limited Power of Attorney – This POA is made to be used for limited matters, such as a single real estate transaction or other discrete matter. 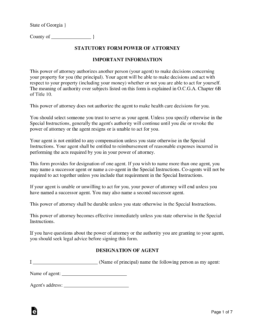 Medical Power of Attorney (Advance Directive for Health Care) – This form is used when someone wants to make sure that he or she has a trusted person available to make decisions on his or her healthcare in the event he or she is no longer able to do so. Power of Attorney Revocation – This form is used to revoke any type of power of attorney that may have been created in the past. Real Estate Power of Attorney – Rely on someone else to act as your fiduciary for the sale of real property. Tax Power of Attorney (Form RD-1061) – This form is used when you wish to have someone represent you in front of the Department of Revenue. Vehicle Power of Attorney (Form T-8) – This form is used when you wish to have someone represent you with the Motor Vehicle Division.